Smothered Burrito! 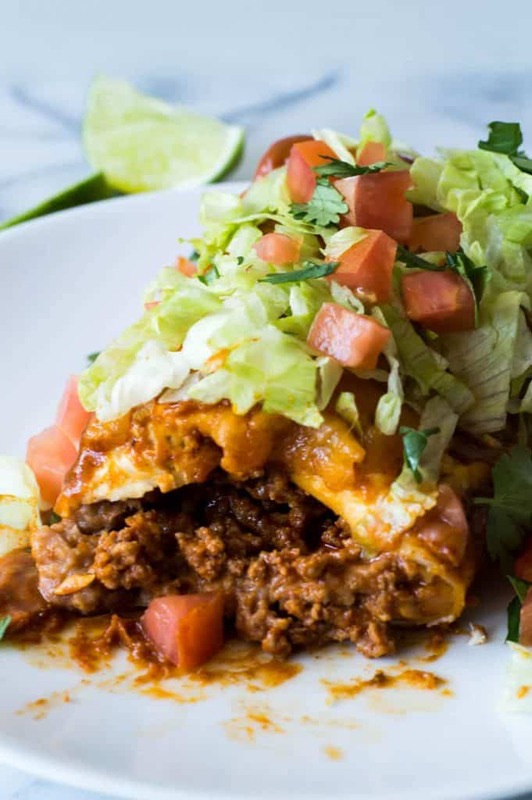 These large burritos are bursting with ground beef simmered in a homemade taco seasoning, smooth and creamy refried beans, and lots of melty cheese! Then smothered in homemade chili gravy and even more cheese! Hearty, savory, and comforting! 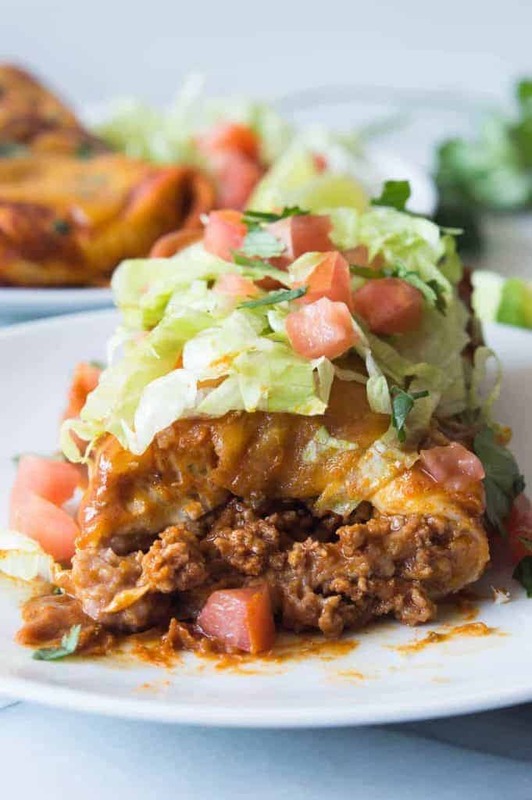 These easy smothered burritos will quickly become a favorite dinner! 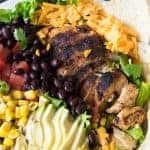 What is a Smothered Burrito? 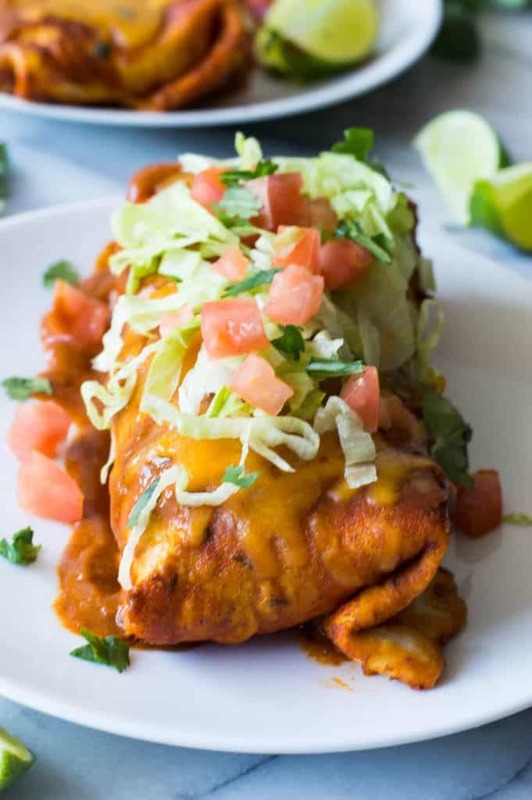 A smothered burrito is basically a burrito that has been smothered and covered in a red enchilada sauce and melted cheese. It’s also called a wet burrito. In the case of this particular recipe the burrito is loaded up with rice, beans, ground beef taco meat, and cheese. Topped with lettuce, tomato, and cilantro. How do you make a smothered burrito? This burrito is loaded up with a mixture of ground beef, beans and cheese. Simple yet hearty and filling. The best part? This meal is completely customizable. You can load your burrito up with your favorite filling! 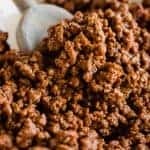 The ground beef is cooked and then mixed with a homemade taco seasoning and some tomato sauce. I used some Homemade Refried Beans, but to save time you can always use a canned version. And tons of melty, gooey cheddar cheese. These are also wonderful loaded up with some Mexican Rice. The enchilada sauce that is used on the top of this burrito is my homemade all time favorite ENCHILADA SAUCE. This sauce is the heart of great Tex Mex food. Spicy, flavorful, and completely addicting. I have made this sauce so many times because I use it on EVERYTHING! This recipe makes enough to make 8 burritos. I have a large family, so this is perfect for family dinner. So definitely feel free to cut the recipe in half. To bake the burritos, lay them in a large dish, pour the sauce over top, sprinkle with cheese and bake uncovered. . If you need to prep these ahead of time you can make the burritos, place them in the dish and just cover and keep in the refrigerator until you’re ready to bake. Then prior to baking spread the sauce on top, sprinkle the cheese and bake. 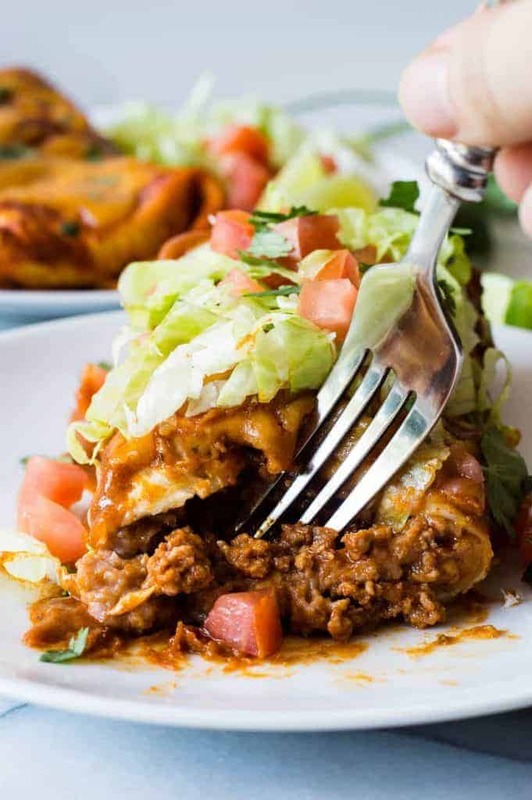 WANT TO TRY THIS SMOTHERED BURRITO? 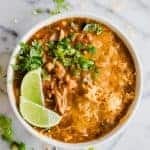 PIN IT TO YOUR DINNER OR MEXICAN FOOD BOARD TO SAVE FOR LATER! 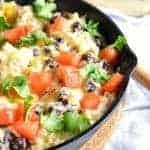 This Smothered Burrito Recipe first appeared on Food Fanatic. My 16yr old can’t get enough of this recipe… He wants it every wk now! I have to admit it is very good & easy to make! I made these last night. Absolutely delicious! They instantly became a family favorite. Thank you for recipe! Just tried this recipe. Very tasty! Thanks! Just made these tonight and they were delicious! My husband loved them & he is very picky. I halved the recipe & we still have enough for another meal. Gravy was so yum. Definitely a keeper! Amazing! These were so good, and I could’ve eaten the gravy on it’s own…. like soup! Usually I add this and that, more spice, less salt… I didn’t change one thing, the recipe is fabulous. My family loved it, thanks! Living where I do, on the coast of Ecuador Mexican food is amost impossible to get. 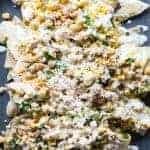 This recipe is fantastic I made it last weekend and getting ready to make it again. Thank you. Making these for dinner tonight per hubby’s request. I used nacho cheese for the top, hoping it turns out delicious! This is a really good dish. I made it tonight and devoured it. The gravy is great as is but ,after a seasoning taste test I added one more item: 1 Tbsp of unsweetened cocoa powder. Gives it a deeper mole note. Great recipe. Thanks for sharing! Such a great idea Bob! So glad you enjoyed the recipe. Thank you for this! I wasn’t sure how to make the sauce for smothering and this is just what I had in mind. Delicious.